The 2012 El Yunque National Forest Quarter will be the first of five 2012-dated strikes released under the US Mint's America the Beautiful Quarters® Program. 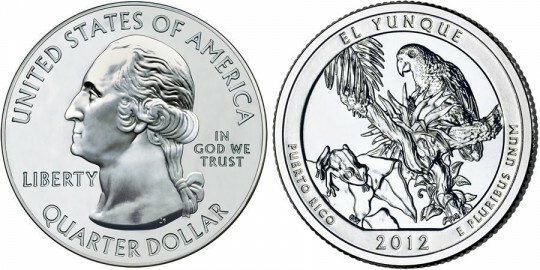 Shown on the reverse of the coin will be a design emblematic of El Yunque National Forest found in the United States territory of Puerto Rico. This release marks the eleventh in the series overall which debuted with five 2010-dated strikes. The program is scheduled to issue five new strikes annually until 2021 when the last of fifty-six new coins of the series will be released. Fifty-six coins allows for one strike to represent a site of national interest from each state as well as the five US territories and the District of Columbia. In this respect, the America the Beautiful Quarters Program is extremely similar to the preceding 50-State Quarter series and its follow-up the District of Columbia and US Territories series. Each strike honors a different site with this coin featuring a reverse emblematic of El Yunque National Forest. The forest was originally established as Luquillo National Forest and then later it was called Caribbean National Forest. The name was changed to El Yunque in 2007 to better reflect the wishes of local citizens who refer to one of the mountains of the forest as El Yunque. The reverse shows both the flora and fauna of El Yunque National Forest. In a dense patch of tropical vegetation, a Coqui tree frog and a Puerto Rican parrot are shown. The reverse was designed by United States Mint Artistic Infusion Program (AIP) Master Designer Gary Whitley and sculpted by United States Mint Sculptor-Engraver Michael Gaudioso.